This small fragrant shrub can be a good choice for shaded areas, such as under oaks. 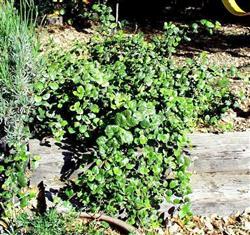 Green, glossy leaves on long, arching reddish branches indicates the common name, Evergreen Currant, while it's aromatic leaves and flowers have prompted the common name, Catalina Perfume. This mid-to-low spreading shrub produces cute, star shaped flowers that are pink-purple with a bright white dot on the base of each petal. The flowers are small but lovely all the same. Use this plant as a shrubby ground cover. It can take sun on the coast but needs at least partial shade inland. We have found it to tolerate hot summers and cold winters in our inland garden and have not found it to be damaged by rabbits or other mammals. Expect this plant to grow to about 3' high and 6' wide.